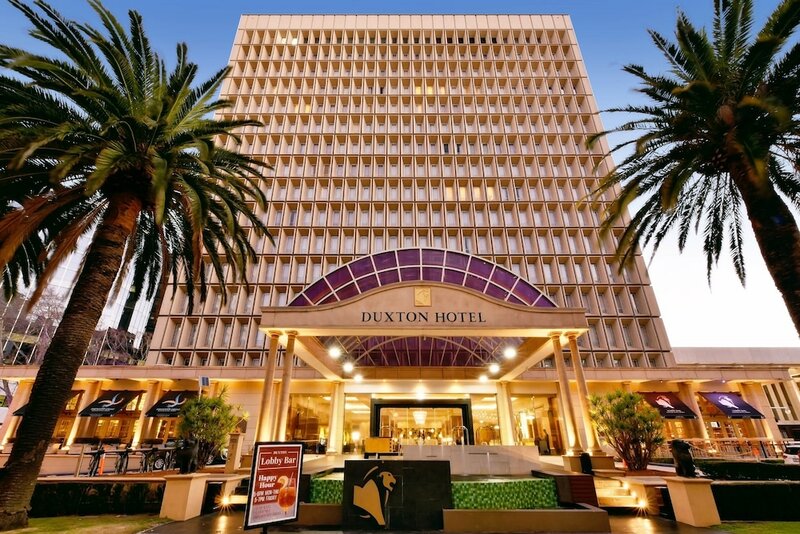 A stay at Duxton Hotel Perth places you in the heart of Perth, within a 10-minute walk of Royal Perth Hospital and Hay Street Mall. This 5-star hotel is 1 mi (1.5 km) from Elizabeth Quay and 2.3 mi (3.7 km) from Crown Perth. Make yourself at home in one of the 306 air-conditioned guestrooms. Complimentary wired and wireless Internet access keeps you connected, and cable programming provides entertainment. Private bathrooms with separate bathtubs and showers feature complimentary toiletries and hair dryers. Conveniences include phones, as well as laptop-compatible safes and desks. Treat yourself with massages and facials. You can take advantage of recreational amenities such as an outdoor pool, a sauna, and a 24-hour fitness center. Additional amenities at this hotel include complimentary wireless Internet access, concierge services, and wedding services. Satisfy your appetite for lunch or dinner at the hotel's restaurant, The Firewater Grille, or stay in and take advantage of the 24-hour room service. Need to unwind? Take a break with a tasty beverage at one of the 2 bars/lounges. Buffet breakfasts are served on weekdays from 6 AM to 10:30 AM and on weekends from 6:30 AM to 11 AM for a fee. In addition to an outdoor pool, Duxton Hotel Perth provides a sauna and a 24-hour fitness center. The hotel offers a restaurant. Guests can unwind with a drink at one of the hotel's 2 bars/lounges. Public areas are equipped with complimentary wireless Internet access. A 24-hour business center is on site at this 5-star property. This luxury hotel also offers concierge services, complimentary newspapers in the lobby, and laundry facilities. Parking is available onsite for a surcharge. Duxton Hotel Perth is a smoke-free property. Buffet breakfasts are available for a surcharge on weekdays between 6 AM and 10:30 AM and on weekends between 6:30 AM and 11 AM. The Firewater Grille - This restaurant serves breakfast, lunch, and dinner. Recreational amenities at the hotel include an outdoor pool, a sauna, and a 24-hour fitness center. This property's policy is to refuse certain bookings for the purpose of group events or parties, including pre-wedding stag/bachelor and hen/bachelorette parties. Reservations are required for massage services and spa treatments. Reservations can be made by contacting the hotel prior to arrival, using the contact information on the booking confirmation.